Tom Rouse presents what's been happening this week beyond this sceptred isle. 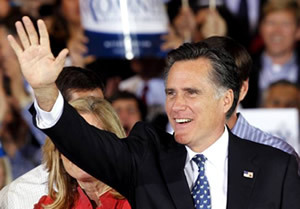 Mitt Romney stormed to victory in Florida, ending the day with a comfortable 14-point win over Newt Gingrich. In large part this was due to an advertising blitz in the last week of the campaign, with estimates suggesting Romney spent up to five times as much on advertising as Gingrich. However, this advertising blitz did little to encourage Republican voters to turn out, with 300,000 fewer voters turning out this year than in 2008. Sober minds within the GOP must now consider whether their campaign to find a non-Romney nominee is now all but over. More moderate voices will be calling for the party to unite behind Romney and anoint him as their candidate. Doing so will avoid a protracted scrap and give the party the best chance of beating President Obama in November. The president has not been siting idly by while the Republican party try and find a credible challenger. The President’s expansion of a scheme to help homeowners struggling with mortgage payments has been widely criticised by opponents as a election year ploy. This is unlikely to dismay the Obama administration, who will view helping the middle classes versus helping the rich as one of the key dividing lines between the two parties in the run up to November’s election. He echoed this theme in a speech to the National Prayer Breakfast, arguing Jesus would have taxed the rich and criticising Romney’s remark that he’s “not very interested in the poor”. This attempt to draw clear dividing lines between the parties comes on the back of a poll which reveals Obama to be the most polarising President of the last 60 years. In part this reflects longer-term trends in US politics which have resulted in the GOP moving steadily further right in response to Bill Clinton’s repositioning of the Democrats. However, it does run contrary to the bi-partisan spirit of Obama’s election campaign, in which he promised to heal the scars which divided the country. The drawing of battle lines is matched by a small revival in Obama’s poll ratings, with the latest Gallup polls giving him a 46 per cent approval rating. Although still a long way off the ratings he would hope for in an election year, this increase does suggest that he has arrested his recent slump off the back of last week’s State of the Union address. More importantly, the US’s economy looks set to continue to grow, with recent data showing that hiring levels have hit a high not seen since January 2008. Egypt was rocked by a disaster, which has uncomfortable echoes of the Hillsborough tragedy. Seventy four fans were killed following a pitch invasion and riot at a match between two of the country’s leading football clubs. This is the latest in a string of incidents to have hit Egypt in recent months and in an attempt to protect themselves, politicians have been quick to divert the blame elsewhere. Prime minister Kamal el-Ganzouri has blamed Egypt’s Football federation for the disaster, dissolving the body and referring officials to the state prosecutor. However this response has not chimed with ordinary Egyptians, who took to the streets of Cairo on Thursday to protest against the Police’s failure to do more to prevent the tragedy. A terrorist attack in Colombia killed seven and injured 70 more after a motorcycle laden with explosives drove into a police station in the notorious city of Tumaco. Police officials have blamed the rebel group Farc for the bombing. This bombing is the latest suspected attack by the left-wing rebels, who remain active despite repeated efforts by the government and military to shut them down. Farc have yet to claim responsibility for the attack, but were responsible for a similar attack in October, which claimed the lives of ten soldiers. The ongoing crisis in Syria looks set to continue. Russia’s refusal to support a proposed UN embargo on the country has led the US and its partners to drop demands for sanctions. In exchange, Russia has agreed to support a resolution which its proponents believe will pave the way for a regime change in the nation. However, the new deal permits Russia to continue selling weapons to Syria, raising questions about what effect, if any the UN’s efforts will have on the ground.